The Clarion Inn at Lake Buena Vista, a Good Neighbor Hotel close to Walt Disney World®, welcomes your little Pluto on your next vacation. Advance reservations are required. Guests will be charged a nonrefundable $15 fee, per pet, per night, and per guestroom. Applicable taxes apply. For the safety of your pet, our guests, and employees, we ask you follow the rules detailed in our Pet Policy form. 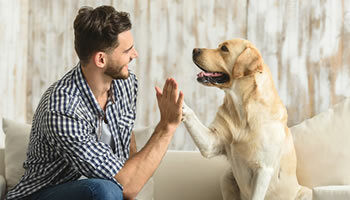 These rules cover proper handling of your animal companion while in your guestroom and on hotel property, and housekeeping procedures of guestrooms accommodating four-legged guests. We have specific guestrooms just for you and your pet that have easy access to walk areas outdoors. Make proper reservations by calling our hotel at 1-407-996-7300 or 1-800-999-7300.